If you have any questions on this post, please ask. Go to bottom of this page to comment. Tata Cards is a commercial arrangement between SBI and Tata Capital Financial Services Limited. SBI Card was launched as a joint venture between the State Bank of India and GE Capital. GE Capital Business Processes Management Services Limited (GECBPMSL) takes care of the technology and processing needs of Tata Cards, while SBICPSL focuses on customer acquisition, marketing and risk management of Tata Cards. We have different cards for different needs, go for the Tata Card best suited for you Enjoy premium benefits and luxury. Pay your other bank credit card balances at lower rate of interest. ** Save money with lower interest rates. Just transfer your outstanding balance to Tata Card. ** Transfer your other bank credit card balances to Tata Card and enjoy a lower rate of interest. ** Save money and pay back through convenient payment options. ** Transfer your outstanding to Tata Card. Save more with lower interest rates & pay back in EMIs. ** If you transfer the outstanding balance from a Credit Card, the BT amount will be transferred within 3 working days. ** If your other bank card is not a Visa card, you will receive a cheque of the BT amount within 5 working days. ** Flexible payment options make your spending delightful and stress-free. Pay back your big purchases in flexible installments. ** Enjoy hassle-free money with convenient repayment options. 3. Click on Track Button. 4. Click on Retrieve Button. Make TATA Card payment anytime, anywhere, using or net banking facility of over 50 banks across India. ** Pay your Tata Card dues online, using National Electronic Funds Transfer (NEFT), a quick, simple and secure way to pay your Tata Card Bill. ** Make payments anytime, at your convenience from any bank account that offers the NEFT facility. 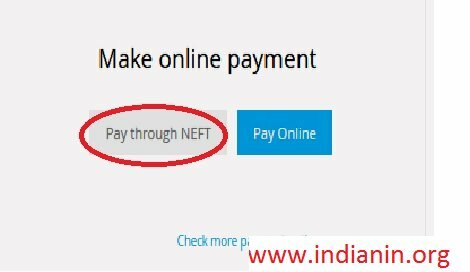 How to register and pay using NEFT ? Step 1 : Log in to the net banking facility of your bank. Add Tata Card as a beneficiary, under third party transfer. Step 2 : Add the IFSC code SBIN00CARDS for making Tata Card payment. Step 3 : Enter your 16-digit Tata Card number in place of account number on the banking page. Step 5 : Fill Bank Address as PAYMENT SYSTEMS GROUP, STATE BANK GITC, CBD BELAPUR, NAVI MUMBAI. Step 6 : Click submit button to complete your registration process. ** Make TATA Card payment anytime, anywhere, using or net banking facility of over 50 banks across India. How to pay using Paynet-Pay Online ? Step 5 : Confirm the details and be securely re-directed to your bank’s payment interface to authorise the payment. Your account will get debited online and you will receive an online transaction confirmation with a Transaction Reference Number which will also be sent on your registered mobile no. and e-mail id. Step 1 : Click here to proceed to Paynet-Pay Online. ** We help you pay your Tata Card dues on time. Make payments directly from your SBI account. Step 1 : To register, log in to onlinesbi.com, using your net banking user ID and password. Step 3 : Select the Add option in the ‘Manage Biller’ section and opt for All India billers , and select ‘SBI Cards and Payment Services Pvt. Ltd.’ as the biller. Step 4 : Register your biller details by entering your name and credit card number and click ‘Submit’. You will receive an SMS carrying a One Time Password (OTP) on your registered mobile number. Step 1 : Click on view/pay bills section and click on ‘Without Bills’. Step 4 : Enter payment amount and click on ‘Pay Now’. Click on submit to confirm your transaction and follow the instructions. Your payment is now done. ** You can conveniently pay your Tata Card dues online, using Electronic Bill Pay service. You can avail this service through net banking, ATM, or mobile service of State Bank of India, Indian Overseas Bank, Citibank and Bank of India. How to pay using Electronic Bill Payment service? Step 1 : Log in to the net banking page of the aforementioned banks where you have a bank account. Step 2 : Add ‘Tata Card’ as a biller. Step 3 : Fill in the details about your card number and payment amount and make the payment. ** National Automated Clearing House (NACH) saves you the effort of issuing cheque every month towards the payment of your TATA Card dues. ** You need to authorize TATA Card to deduct the amount directly from your bank account every month and your card account will be credited on the payment due date. How to set up NACH and pay using it ? Step 1 : Click here to download the NACH form from our Forms Central. Step 2 : Print the form and fill in the required details. ** Tata Card helps you in paying your credit card dues on time. Get the amount deducted directly from your State Bank of India bank account on your payment due date. 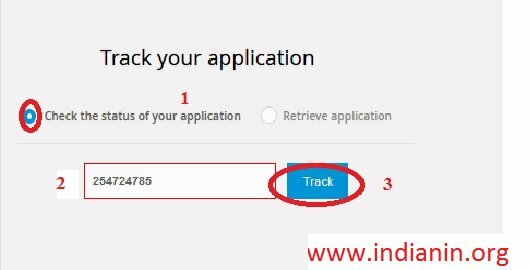 How to enroll for SBI Auto Debit ? Step 1 : Click here to download the Auto Debit form from Forms Central. Step 2 : Take the print out of this form and fill in the required details. Step 3 : Get the form details verified from the bank. SBI Cards and Payment Services Pvt. Ltd.
** Tata Card believes in making your life simpler. Now pay your Tata Credit Card outstanding securely using your Debit card. How to pay using Debit Card ? Step 2 : Please enter the Tata Credit Card number you wish to make the payment for, along with payable amount and your email ID. Step 3 : Click on Debit Cards as your chosen mode of payment and select the bank account you wish to debit from. You will be securely redirected to the bank payment interface of your chosen bank account. Step 5 : Please confirm your payment amount to Tata Card. On confirmation, your bank account will be debited online. We will send you an email and SMS acknowledgement of your transaction. Step 6 : Transact using BHIM SBI Pay by sharing only your Virtual Address. How to pay Tata Card bill ? ** Opt for the convenience of paying your Tata Card bill on go, through the YONO by SBI. YONO is an initiative by SBI to bring all its joint venture’s customer through digital technology “YONO mobile app” and “YONO website”. ** Banking simplified – Easy to understand interface, simple and intuitive navigation & Instant Payment Credit. How to register on YONO? ** Login to YONO by SBI with MPIN or Login password. ** Pay your Tata Card dues over the counter at any SBI branch in India. ** Deposit your payment cheques in electronic drop boxes and get instant receipt. ** Like going the traditional way. Drop your payment cheques in any of our drop boxes available across the country. ** Pay your bills using SBI Debit Card, across any SBI ATM in India. Enter your User ID and Password to Log In to view your card statement online. 3. Click on Login Button. Access your online Tata Card account, anywhere, anytime. Register yourself at tatacard.com in 3 simple steps. 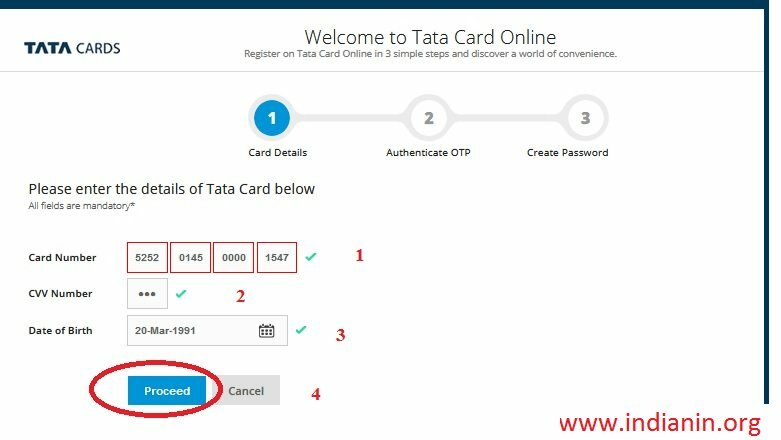 Welcome to Tata Card Online Register on Tata Card Online in 3 simple steps and discover a world of convenience. 4. Click on proceed button. At Tata Card, we believe you should have the most out of every rupee you spend. ** Get upto 5% value back as points on spends on TATA Partner outlet*. ** 3x points on Dinning, departmental store, grocery and International spends. ** 1 Point for every Rs. 100 spent on other retail outlet. ** Introducing India’s first multi brand loyalty program – The Empower Program, a unique ever growing alliance of leading brands, which allows you to earn and redeem points across brand you use regularly You can redeem your Empower Points at any participating Tata brand outlet. 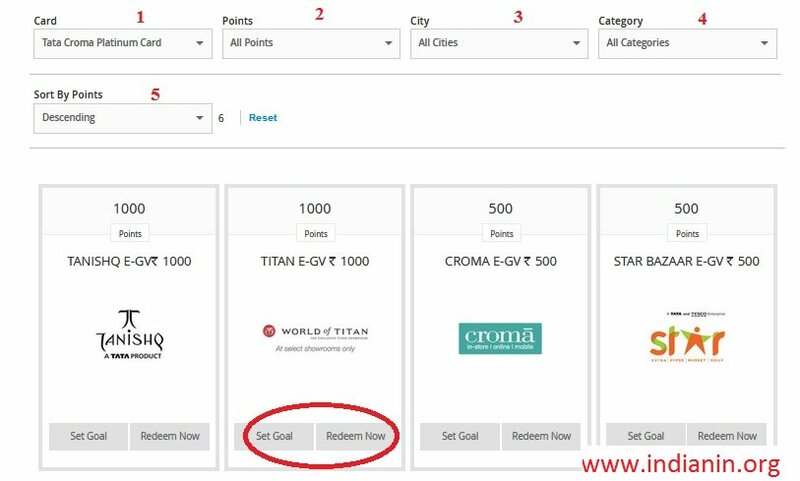 ** Pick a product or products of your choice, present your TATA card and redeem the points instantly. ** Please swipe your Tata Card only on a Tata EDC machine for redemption of Empower Points. You have a need, we have a deal with tata cards. 5. Click on All offers,then offers list will be displayed below. Q1. How do I block my credit card? When a card is lost or stolen or damaged, the same should be blocked immediately and reissued. SMS send BLOCK XXXX (Last 4 digit of your card number) to 5676791 from your registered mobile number. Q2.How do I report Lost/Stolen credit card and reissue through website? Q1. How Can I check my Card Dispatch Status? You can login to your Tata Card account at tatacard.com or write to us at to check the dispatch status. You can also call us on our helpline number 39 02 34 56 (prefix local STD code) or 1800 180 8282 to check the dispatch status. Q2. What documents are required for validation check at the time of card delivery? The following original documents are required for validation check at the time of Card Delivery. Q1. How do I reset my online account password? Q2. 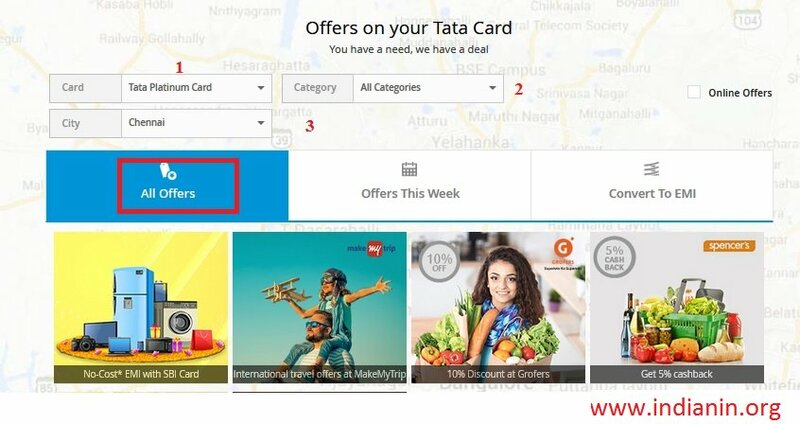 How can I access the new Tata Card website? Do I need a new username and password for the new website? The process of logging in to the new Tata Card website remains unchanged. You can use your existing Tata Card online user id & password to manage your Tata Card account online. Q1. How can I stop promotional calls/SMS or E-Mails on my register Mobile Number/ E-Mail ID? To stop promotional calls/SMS or E-Mails on your register Mobile Number/E-Mail ID, please call us on our helpline number 1800 180 8282 or 39 02 02 (prefix local STD code) or write us at customer.care AT tatacard.com The process will take 45 days to stop. Q 1. What is Simply SMS? The Simply SMS facility lets you receive information related to your Tata Card or TATA Card in an SMS. You only need to SMS KEYWORD (specified for your query) XXXX where XXXX = Last 4 digits of your SBI or TATA Card number to the short-code 5676791 from your registered mobile number. Q1. What are the features of my card? The features of a card depend on card type, click here to know about them as well as to apply for cards. Q2. What are the offers & deals available on my cards? Offers are launched time to time with a limited period validity. Some offers are restricted to specific card types, vendors & location as well.